Our wonderful hosts were the Capital City Condors who had the incredible task of catering and scheduling matches for 73 teams – The largest Special Hockey tournament yet. Special Hockey goes from strength to strength thanks to the amazing players, coaches, sponsors and volunteers who provide an unforgettable experience year on year. We are very grateful to Capital City Condors and all the other teams for their friendship and hospitality. Most of the team arrived on the day before the tournament started and found a cold and snowy Ottawa. The opening ceremony was held at the Canadian Tire Centre, home of the National Hockey Leagues Ottawa Senators. 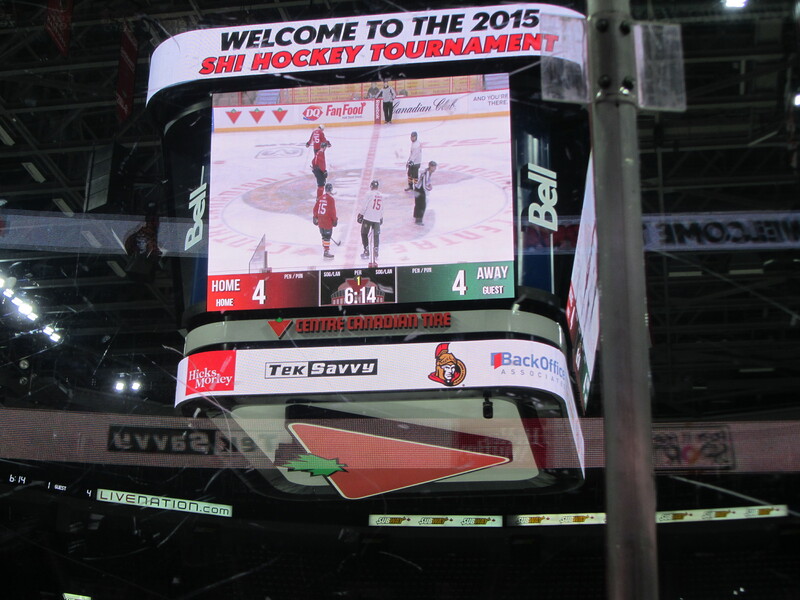 Prior to the opening ceremony, the coaches from the teams played in a match on the ‘big stage’ with some guest players from the Ottawa Senators Alumni. Werewolves coaches Jerry and Christopher both participated in the match and Jerry was even accredited with a goal! Coaches Jerry and Christopher make the big screen! The opening ceremony included attendance from Allan Hubley, Ottawa Councillor, Cyril Leeder, Ottawa Senators President, Kyle Turris, Ottawa Senators & the Capital City Condors Honorary Captain and Patrick Wiercioch, Ottawa Senators & the Capital City Condors Honorary Assistant Captain. The following day the special hockey matches began. Werewolves opponents were the Grandravine Tornadoes 1 team in the morning and the Grey Bruce Falcons in the afternoon. The Werewolves acquitted themselves really well and it was great to see everyone working together in the spirit of special hockey. In the evening, a special treat for the players and their families as they attended the NHL match between the Ottawa Senators and Boston Bruins. In a packed arena and highly charged atmosphere, the home side came out narrow victors. Coach Jerry presented a Werewolves of London shirt to Matt Bennett, the Sales Manager of Senators Sports & Entertainment and it will now have a new home in the arena. What an amazing honour! After all the excitement of the night before, Werewolves had their final two matches to take part in on the Friday and played the Grandravine Tornadoes 4 team and Barrie Colts. Once again our team worked hard and fair with goals right across the team and our goalies playing fantastically making some great saves. With the Werewolves matches all successfully completed, the team received their medals. In the evening the whole team came together for a meal and had time to relax. There were no matches for the Werewolves the following day so it was a perfect opportunity to try out the outdoor rink, visit the shopping mall and see the sights. The next big event would be the banquet in the evening where food is served and players, parents and coaches can mingle with other teams, swap pin badges and party! Whilst most the team packed up ready to leave and the weather turned colder, there was time for some of the team to visit Fultons Pancake House and Sugarbush in Packenham. This is a historic maple sugar camp. 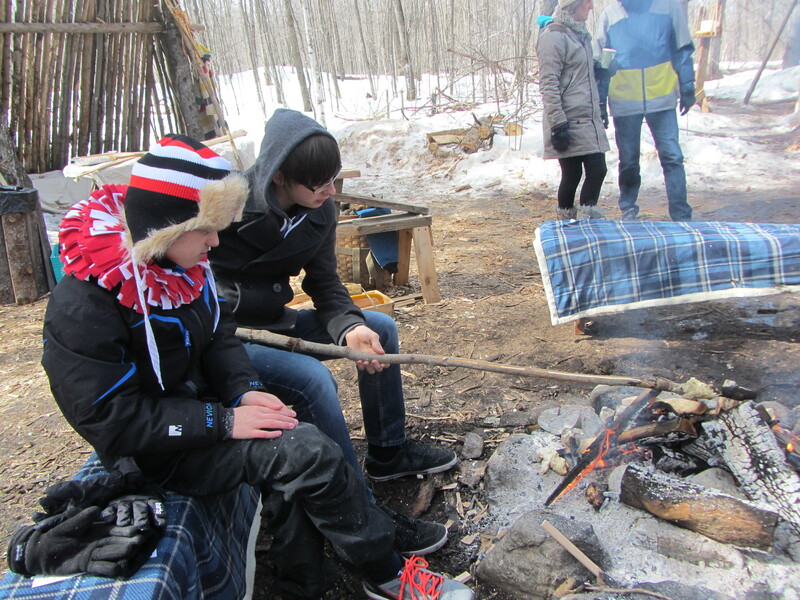 The farm included a nature trail, bush craft and sleigh ride. On the way home there was time to reflect on a packed few days with much to remember and cherish. Our thanks to the dedication of our players, parents and coaches who made the trip and all the others who raised money towards it. Its fantastic for our club to be represented and for our players to get the opportunity and experience of an event where they truly are the stars. More photos and videos from the tournament are available here with more being added soon. Credits to Becky Williams, Nigel Williams, Tracey Shepherd and Jerry Hildreth for the pictures.